Cute dogs and puppies are adorable, but looking cute does not always mean well mannered. 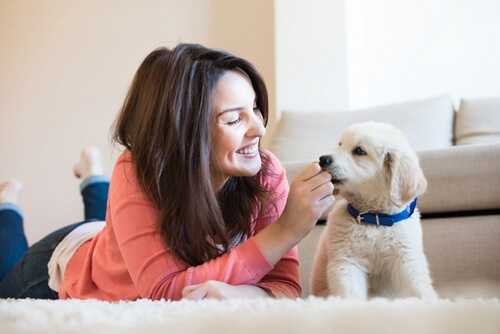 If you’ve just brought a puppy to your home then… hurray! But don’t keep your excitement for too long since there is much to be done for your new family member. Raising puppy is a fun, yet can be problematic at times. Therefore, let’s get on the training-train with your buddy puppy and we will take a look at the top 30 tips of puppy training! *Note: These tips are gathered from personal and other people’s experience. And if you also have some new tips, feel free to share with us! “Think twice? Puppies are cute! What’s wrong with raising them?” True, puppies are adorable. But raising puppy is a different story. Raising puppy will require several factors, including our own effort and commitment from other family members. Our puppy is adorable, but one day it will become a grown “4-legged gentleman” or “lady”. And the growing progress is a long-term journey. Therefore, if you did not prepare physically or even mentally, puppy training can be a headache rather than happiness. 2. Getting an educated puppy? Why not? As always, a good start is more beneficial for later progress. This good start begins right when you choose a puppy. 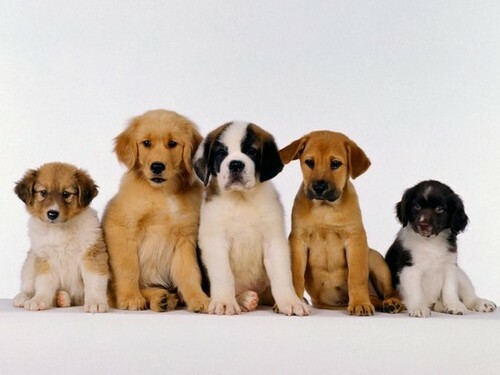 It’s mostly suggested to choose a puppy which is raised with people’s influence and companionship. It’s the best if the puppy is already raised by those who focused on educating it. Of course, this tip doesn’t mean you absolutely have to choose an already trained puppy. Sometimes faith gives you an untrained puppy and that just means you will need to educate him more. This may sound serious, but it is not that serious as people may think. 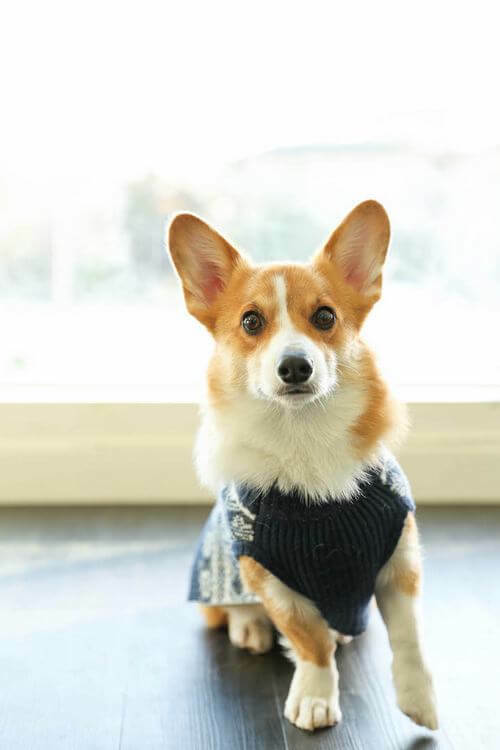 And also, it is necessary if you want to raise a perfect 4-legged companion. As mentioned, raising a new puppy requires consistent training and caring. This is a long-term process so preparing a schedule will be much helpful straight from day 1. Also, remember to follow your schedule constantly (this will be explained in due time). Like human baby, a puppy’s health is not all strong. Even if it has a minor sickness; this can be a problem for its adaptation to the new environment. And also, it will be difficult to get to know your puppy if it is sick. 5. Get a crate! Fast! The canine is sort of… den dweller which likes to stick into dark, small place. Well unfortunately for our puppy, our home isn’t a wild jungle to have such a “den”. Therefore, we should make one for it ourselves. In this case, we use crate, including a blanket if necessary. 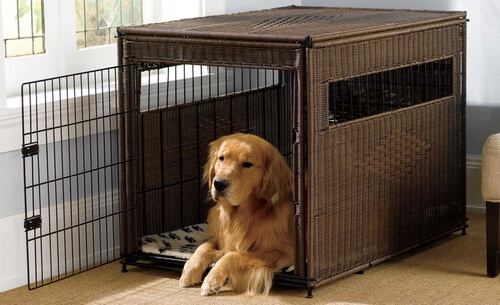 The crate will act as a “den” for puppy. In addition, crate will be a great help in housebreaking training. Naturally puppy won’t poop its den. And by taking puppy outside frequently, it will learn to stay patient until being released outdoor. Here is Dr. Becker’s recommendation about crate training: “Never force your dog into or out of a crate” and “Keep it positive”. Our human body can digest pretty much every food in the world without problem. But in case of dogs and puppies, there are several types of food which can be bad for dogs and puppies’ health. Some are even fatal for them, such as chocolate. Therefore, it’s better to research about dogs and puppies food as early as possible. This will be the best if the entire family agrees to get along well with our new little member. As always, when the puppy arrives at a totally unfamiliar environment, it may feel insecure. In that case, let’s let it know that this is its new home and it’s a part of the family. With caring and love, puppy will gradually feel safe and get used to the family. This can sound boring but again: puppy training is a long-term progress. Like a human baby, a puppy does not know what’s good and bad in this new family. Therefore, it’s best to keep our cool even if our puppy did something wrong. Wrong behavior does not necessarily mean bad puppy, it just means that puppy didn’t know that’s bad in the first place. Good thing is: puppy often tries to please us so… let’s be patient then! 9. Consistency is… another key! Remember when we said “follow schedule constantly”? It is for this tip. Puppy training requires time for puppy to learn the rule. If we don’t stay consistent in our training, the puppy will get confused and it won’t understand what it supposed to do. If you already have confidence in raising your little guy then congratulation! That is a big boost. But for those who still feel somewhat afraid of commanding your pup, remember that you are supposed to be its leader. Dog is kind of a pack animal, and in a pack the alpha is the one who leads. In this case, we are “the alpha” and the puppy will look up to us. Be confident, and our pup will know who is in charge here. According to many dog trainers, the first 16 weeks of our pup is the sensitive learning time. Around this time puppies will learn about their surroundings, including people, other dogs, cats, etc… If the puppies are properly trained during this period, they will become more kinds to other people and pets. (guess this is first step to become gentlemen or lady then? Giving treats is cool but it seems some people may overdo it. Abusing treats freely without consideration can make our puppy get used to “free treats” and it will be extremely annoying in adulthood. This is a simple tip but it’s quite an effective way to tell our pups which places are not allowed getting in. By blocking the entrance, our pups will understand this is “keep out” zone. 15. Let’s use some commands! “Watch me”: Have you ever experienced the time when your puppies get distracted by some birds, cats, or squirrels? If the answer is yes then “Watch me” command will be your call. “Go to your spot”: Sometimes our puppy likes to jump at the guests at the door. In that case, teach them this command and next time they won’t bug our guests like that again. 16. Take a puppy record! This isn’t really necessary when you raise a puppy, but it can be of great value during your raising progress and for memory purpose. By taking record of your puppy’s behaviors each day, you can keep track your progress and understand what to do next. In addition, it is always heartwarming to see memories of our puppy training process when we know that our effort was not for naught. Basically socialization means interacting and communicating with the society. In this case, our pups need to learn socializing with other unfamiliar people and pets. There are many cases in which dogs and puppies are aggressive to the outsiders. While some believe that is the “nature” of some typical dog breeds. It is not always the case. Even the so-called “friendly dog breeds” can react aggressive or become shy towards other people and pets. Luckily, if we take our little friends outside (for example: park) more often, “society aggression” will no longer be a problem with our puppies. “Aw look at it! It jumps to my lap and that so cute!” Well true it’s cute, we also understand that feeling. But sadly our puppy won’t remain as small puppy forever. Soon he or she will become mature with huge body. And that huge body won’t look cute when it jumps into our body… But again, if you raise a small dog breed like Miniature Pinscher then it is somewhat okay? Dogs have tendency to chew things. Unfortunately for them, not everything at home can be their treats. And so if your puppy likes to chew on things which you don’t want it to, try to distract your puppies with dog toys or other things which you want them to chew. On the other hand, puppy may like to bite us. This doesn’t mean it hates us or anything; it’s a sign of loving (“Aw!”). But no! Don’t allow them to do that! 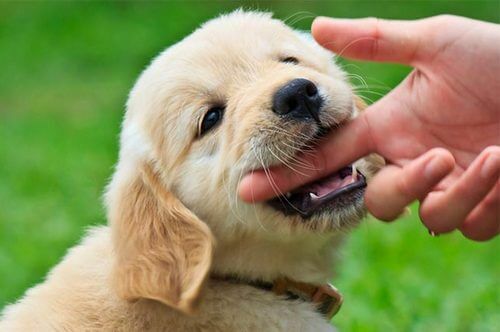 A biting puppy may look adorable, but a biting dog with full grown teeth can be brutal. For this reason, some people suggest to say “no” and hold its mouth for about 1 minute if it bites. That will teach puppy that this biting action is unacceptable. In some cases, puppies may get used to barking at guests or other people. To deal with this problem, some people recommend taking puppies to the outside. When they bark, comfort them and tell them that everything’s fine. This can help calm the puppies and lessen their barking. 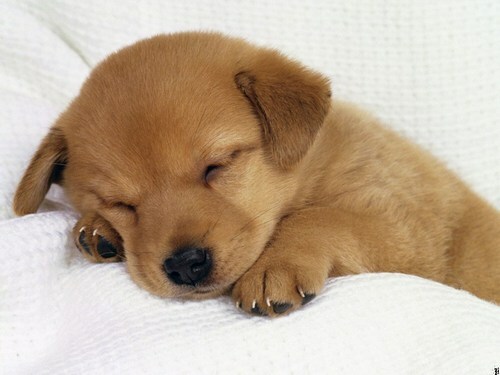 Puppies are energetic and they also need lots of time to nap. These nap times are important for them so try to make sure they can nap without being disturbed. It’s best to give them time and space to rest alone. Regular exercise is important for both physical and mental health of a puppy. But remember not to push them too much. Exercises can quickly tire a puppy out and probably we don’t want to see them “overloaded”. Bringing our puppies to the vets is necessary for health examination. But there are already many cases in which puppies react wildly when being touched by the vets. For this reason, some people suggest to let puppy get used to be touched on its body. 25. Worry of puppy’s carsick? Why not let them get used to cars early? For those who like to travel around with their companions, it would be good idea to drive the puppies in the car early. This can prevent puppies from getting carsick, and also they can get used to our cars. Sometimes it’s delightful to see our puppy and our child growing together. That said, it’s recommended to prevent our child from playing with puppies (even though this may sounds bad). Not all children know how to play with puppies properly, which can result in hurting puppies. In the worst case, puppies may see the children as aggressors and they will try to defend their “territory”. 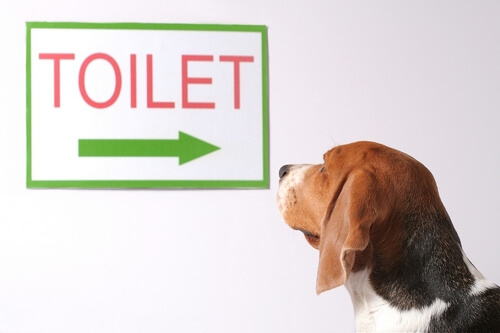 Potty is always a big headache for dog owners, especially inexperienced ones. And so one of suggestions is to bring puppy outside ourselves (provided that they’re small) and place it where we want it to eliminate. This can let our puppy knows where to do its “serious business” and may prevent unexpected incidents to our pup. In order to help our potty training, it’s a good idea to give puppies a little treat and praise them for doing it right. 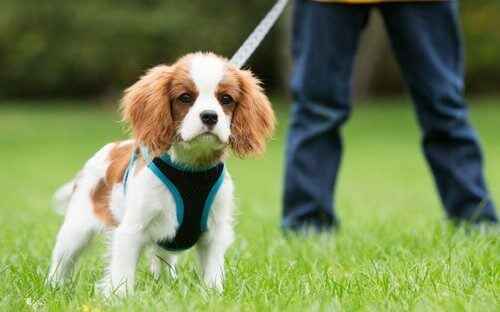 Retractable leashes may look good at first, but as it turns out: retractable leashes can be dangerous for both owners and puppies (and matured dogs also). The main reason is that retractable leash can be snapped easily, rendering them useless in leashing dogs and puppies. This is even more important for some aggressive dog breeds which have great strength and snapping the leash is a piece of cake for them. In terms of puppies, they may not have enough strength to snap the leash. But instead, pulling the retractable leash can become their “hobby”. Traditionally, we used to use leash on dogs’ neck. And from time to time, this kind of practice proved to be potentially bad for owners and puppies also. In many cases, neck leashes can’t properly stop the dogs or puppies, eventually the owners are pulled by them. In some other cases, neck leashes can wrap puppies or dogs’ neck too tightly, resulting in hurting them. And that’s why we change to leash harness these days. Leash harness often wrap around their front chest, giving owners much more control over their dogs and puppies. Also, it is much less dangerous to puppies than traditional neck leash. And that’s it folk! Those are top 30 tips of puppy training! Thank you and stay tune for more news in the future! Pingback: How to Identify a Puppy From Puppy Mills?